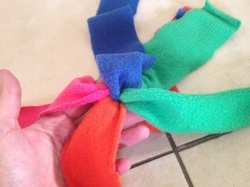 Use an overhand knot to tie one end of each strip together. 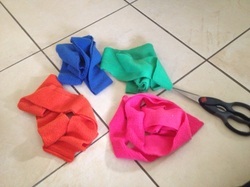 Bring Strip 1(blue) down over strip 3 (pink), and Strip 2 (orange) up over Strip 4 (green). 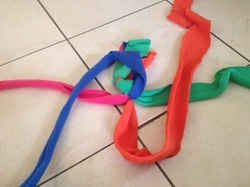 Bring strip 3 (pink) over Strip 1(blue) and through the loop of Strip 2 (orange). 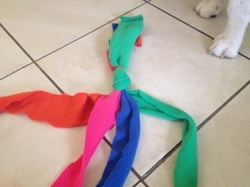 Bring strip 4 (green), over Strip 2 (orange) and through the loop of Strip 1(blue). 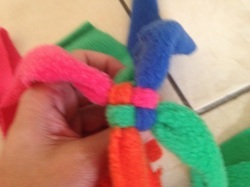 Pull the opposing strips bit by bit, until you form a square shaped knot. 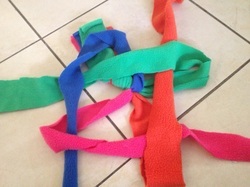 Next bring Strip 2 (orange) down over strip 4 (green) and Strip 1 (blue) up over Strip 3 (pink). 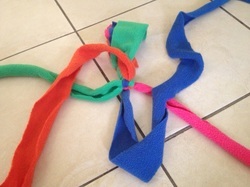 Bring strip 4 (green) over Strip 2 (orange) and through the loop of Strip 1 (blue). 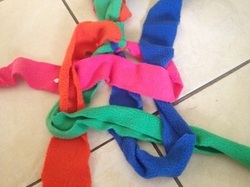 Bring strip 3 (pink), over Strip 1 (blue) and through the loop of Strip 2 (orange). 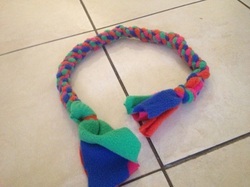 Repeat above steps until you have formed a rope. 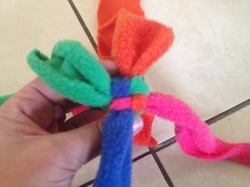 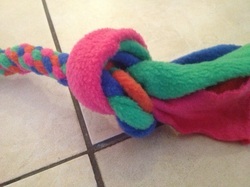 When finished, tie another overhand knot and trim the ends to finish the tug toy. 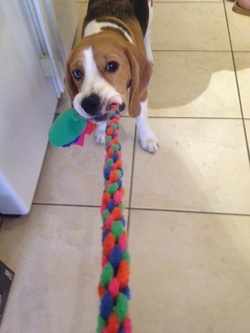 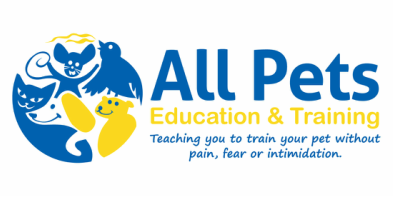 Enjoy a game of tug with your dog.